A great art of being a trainer is setting a target for a horse and making correct programming decisions to enable that goal to be achieved. This takes much planning and skill, and is what separates good and great training feats. 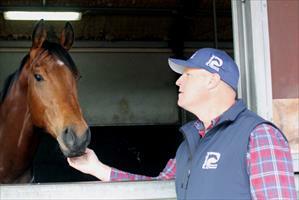 For years Caulfield Cup and Cox Plate winning trainer Danny O’Brien has used a scientific approach for such a task by garnering information through testing the genetics of his horses to ascertain their optimal race distances. Using this cutting edge technology has led to O’Brien joining forces as a Brand Ambassador with Irish equine science company Plusvital. O’Brien philosophy is that trainer’s would be doing their owners a disservice if they didn’t embrace using progressive technologies such as genetic testing. Results of genetic testing saw O’Brien redirect O’Reilly colt Shamexpress to sprinting trips and victory in the Group 1 Newmarket Handicap as well giving the trainer confidence to chase Caulfield Guineas and Cox Plate glories with Snitzel colt Shamus Award. “Shamexpress’ pedigree suggested he would be a Derby horse but thanks to genetic testing it pinpointed early in his career that he was a pure sprinter and this information enabled us to abort running him in longer races and focus his attention on the shorter races,” O’Brien said. O’Brien will act as an official brand ambassador for the company’s innovative genetic tests for thoroughbred horses. The purpose of Plusvital’s genetic testing is to provide objective, scientific information to support breeding, training and race entry decisions. As leaders in equine nutrition since 1975, Plusvital’s supplements and care products have been used by successful trainers and riders across the world. Following their acquisition of Irish equine genetic testing company, Equinome, last year, the brand has continued to focus on improving equine performance through science. “We are thrilled to welcome someone with Danny’s outstanding record of success on board as a Plusvital brand ambassador,” said Plusvital CEO Mike Shelly on the announcement of this new partnership. Plusvital have also revised the price of their genetic testing within recent months, most notably now offering the Speed Gene Test for the accessible price of just AU$395. The company have also bundled this test with their more advanced Distance Plus Test, which further refines a horse’s optimum trip, as part of Plusvital’s Racing GenePak, which is available for only AU$595. The most high-profile recent example of the use of Plusvital’s genetic testing for a horse in training was the decision in the UK last summer to withdraw 2000 Guineas winner Galileo Gold from the Epsom Derby following confirmation that he had tested as a C:C sprint type as per the Speed Gene Test. Galileo Gold has continued to excel at a mile following that decision, including winning the St. James’ Palace Stakes at Royal Ascot. This is just one example of approximately 15,000 thoroughbreds that have been tested worldwide to date. Plusvital is the world's leading provider of genetic testing to the Thoroughbred industry. Powered by Equinome's cutting edge genomic tests, it analyses the DNA of the horse to predict optimum race distance, optimum race surface and performance potential. Plusvital’s clients include leading trainers, owner and breeders in all of the major Thoroughbred regions around the world. Plusvital has an on-going, multi-million euro genomic and nutrition research program at its headquarters in Ireland, with an increased focus on the potential to use genetic testing to identify horses with a predisposition to health conditions, a key industry concern as highlighted at recent Thoroughbred breeders’ meetings.